The first phase of internal political turmoil in Armenia has successfully come to an end on May 8th by the election of Mr Nikol Pashinyan at a special session of the national parliament as the next Prime Minister of Armenia. The second one starts now as the new Prime Minister will have to form his Cabinet (within 15 days) and submit his Cabinet program to the National Assembly for confirmation (20 days after the Cabinet is formed). In the unlikely scenario when the program is voted down, new elections of the prime minister shall be organised in the parliament, and another crisis will loom, which does not seem to be in the best interests of either PM Pashinyan or the Republicans. As things stand today, Mr Pashinyan will lead a classical minority government which will have to seek advise and consent of the majority Republican faction (and other two parties) in the parliament for every significant bill tabled. Few scenarios of the next one year are possible, according to the Constitution - and not the street euphoria -- and the biggest challenge for the new government will be, figuratively speaking, to change their sneakers into Oxford shoes while not losing their popular support. And this process will be everything but boring for ardent observers of post-Soviet politics. There is a massive political awakening in Armenia, which if channeled right may result in democratic consolidation and economic development. While domestic politics will remain hostage to populist sentiments and live broadcasts in social media for another month, the foreign affairs agenda will attract more attention from outside. 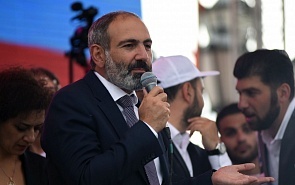 During his rally (or indeed campaign) speeches and the three formal engagements in the parliament (on April 30, May 1 and May 8) Mr Pashinyan, to his credit and to dismay of some supporters, did everything to avoid geopolitical gambles between Russia and the West. After courtesy communications with Russian President Vladimir Putin and Prime Minister Dmitry Medvedev immediately after election on May 8th, and written communications from Brussels and Washington same day, as well as formal assurances that in foreign policy the new cabinet will be in favor of continuity of Serzh Sargsyan's legacy, next few weeks will unveil to what extent these pledges have been situational. Formally, the first overseas trip Mr Pashinyan made was to unrecognised Nagorno Karabakh Republic on May 9th, to celebrate Victory Day and, occasionally, attest to his "Armenia first" message. Nagorno Karabakh issue is traditionally the most emotional and important policy item in Armenia, yet its effects on domestic politics has hugely transformed in the course of the Velvet Revolution due to numerous reasons. On a bigger picture, only some nuances have changed in government stance in the past 30 years despite popular speculations, and it's unlikely Mr Pashinyan and his Foreign Minister will go extra mile on top of the flexibility already shown by predecessors. At the parliament speech on May 8th, he underscored that even though negotiations at the mediation of OSCE Minsk Group have no alternative for the peaceful resolution of the conflict, without the elected leadership of Nagorno Karabakh those negotiations with Azerbaijan should not be considered "full-fledged and efficient". At face value, as much as it caters to the popular sentiments, this is something Armenian authorities have been declaring ever since 1996, yet obviously it takes two to tango, and despite Azerbaijani strict denials, the mediators have emphasized in the past that Nagorno Karabakh authorities will be embraced "at the final stages". This case will be illustrative of how the new cabinet can reconcile their revolutionary rhetoric with political realities, as it may cost the support of the street. Finally, the first major international encounter is expected on May 14th in Sochi at the Eurasian Economic Union summit. It's also expected there will be the first face-to-face meeting between Vladimir Putin and Nikol Pashinyan. Obviously, it's neither in any Armenian or Russian governments' best interest to jeopardise bilateral relations with unnecessary emotions, yet both have local constituencies to serve. To what extent the public statements of the past may affect the closed door give-and-take is unknown, but chances are that bilateral relations, as well as Armenian participation in EAU and CSTO will be enriched with new initiatives, the implementation of which will be dependent on the chemistry developed between Mr Pashinyan and others around the table in Sochi next week.